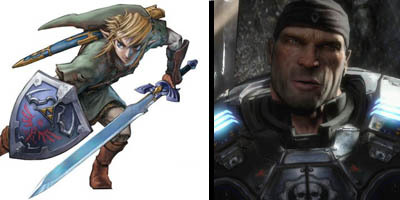 What happens when you receive both an Xbox 360 and a Nintendo Wii for Christmas, and you’re bound and determined to defeat “The Legend of Zelda: Twilight Princess” and “Gears of War” before work starts back up on January 15th? Well, for starters you don’t blog very much. You also tend to skip showers, and you eat most of your meals on the couch in your underwear. ‘Course, those last two things don’t affect you readers all that much, but it’s late, and I’m in the sharing mood. Nice I feel for you Leigh! You could have had Leigh bag and cath ya.